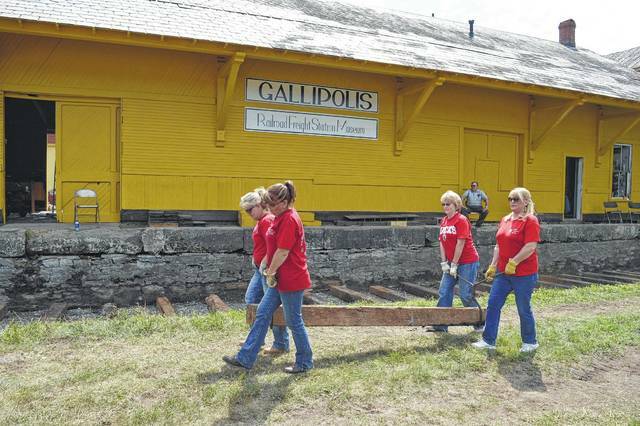 Ohio Valley Bank employees helped lay railroad ties for the Gallipolis Railroad Freight Station Museum last summer. Museum officials say the building’s roof replacement is complete and the exterior of the structure is fully painted. GALLIPOLIS — The Gallipolis Railroad Freight Station Museum is prepared for a steamy summer and hopes to include a few more railroad cars, a steam engine and the rail to go with it. According to Museum Board President Jim Love, the museum recently cut down vegetation in order to dig out a new path in order to lay more rail for more railroad cars. He said the museum is looking at acquiring another car from the Hocking Valley Scenic Railway and would potentially only need to pay for its transport. The museum is looking to acquire two cars and a steam engine. The museum already possesses a caboose which was installed at the museum last year. Love said he had a meeting this Saturday to discuss moving the engine. Love said he is also anticipated to meet with area engineer Randy Breech soon about architectural work on the freight station building. Around $125,000 is slated to head to the Gallipolis Railroad Freight Station Museum and its rehabilitation efforts as part of the passage of Ohio’s capital budget bill which dedicates funds to various applicable projects throughout the state. A member of the state visited the museum Thursday to discuss the funding and rehabilitation efforts the museum would like to tackle first. On top of everything else, the museum is looking at installing a track switch into its plans as it places a somewhat Y-shaped rail system outside the museum.